Your dog is family. It provides unrelenting companionship, and in return it’s important to take care of your dog throughout the year. As the seasons change and you prepare for the weather shift, your dog grooming habits should adapt as well. Even in California’s Mediterranean type climate, the winter months can bring plenty of cold days. Just like a sudden drop in temperature can change your own grooming habits, your dog’s body will react in a similar fashion and you need to adjust your approach to pet grooming. This is especially true if you know you’ll be taking a trip to a wet and snowy area that your dog might not be accustomed to. 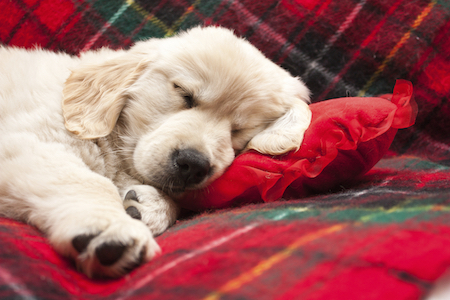 Make sure you use some of these tips to keep your dog happy year round! Regardless of the season, brushing your dog should be a regular activity for you and your canine comrade. During the winter, this is even more crucial to not only your dog’s coat but its general health. In cold, wet weather, a long and full coat is more susceptible to mats. These tangles keep naturally occurring oils that condition the skin and coat from spreading. This leads to dry skin and a less than glamorous coat. The mats can also keep unwanted moisture close to the body, along with attracting other stray snow or debris. By brushing more frequently, not only will you keep the coat looking healthy, you’ll spread the natural oils and improve the effectiveness of a coat’s insulation qualities. If unattended to for long enough, brushing mats can become painful for the dog. Trim any excess fur between or around your dog’s paw-pads that will prevent things like dirt and winter salt from getting caught. Using warm water, rinse or soak your dog’s feet in order to help remove unwanted debris. Keep their nails short, since cold ones can break more easily. Finally, make sure you’re on the lookout for any physical cues from your dog. Are they slow to move, or favoring one leg more than others? Regular inspections of your dog’s feet can help spot any seasonal injuries. Don’t’ neglect a winter wash! Their coat and skin require care, and with the potential for more dirt build up, bath time is a great opportunity to use a moisturizing shampoo/conditioner. Consider a haircut for your dog. If their coat is starting to get unruly and difficult to maintain, it’s completely OK to take them for a cut. Less fur doesn’t mean they’ll be drastically colder, and an easier to maintain coat can actually help in the long run. Be mindful of fleas. While fleas aren’t as common in cold weather, ones already on your dog or in warmer areas are still a concern. Don’t get lazy when it comes to protecting your pup. Keep them dry as much as possible. After any outdoor playing, make sure you dry them off in order to prevent matting and for their general health. Don’t let the cold season get in the way of keeping your dog healthy and beautiful. If you’re ever unsure of what to do or what’s best, reach out to a professional pet groomer for help.